If DIY really is in our DNA then Stan’s a man replete with the substance! 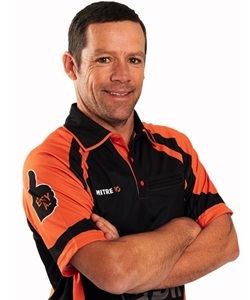 Originally from the Manawatu and before moving to Auckland, Mitre 10’s DIY guru of television and web fame answers a few questions from Business to Business. – In general, do Kiwis really have DIY in their DNA? Bloody oath they do! We come from a long line of hardworking do-it-yourself people. Right from the first settlers, we’ve had a do-it-yourself or die attitude! – Were you any good at woodwork, metalwork etcetera at school? I lived in the Manawatu until I was four, and then moved to the big smoke. I loved woodwork at school; it really was a great place to get creative. For example, one of my projects was coffin coffee table! – You’ve worked both in front of and behind the camera. How did you come to be involved with the TV industry and what shows have you worked on? I started working behind the scenes on many DIY shows a number of years ago, and then got the opportunity to be host/builder/presenter on DIY Rescue, The Fence and Trade Wars. I operated an underwater camera on Celebrity Treasure Island in Fiji and Island Wars in the Cook Islands. I also worked as a builder and third camera on a stunt/adventure show Going Straight, as a builder/project manager and second camera on The Palino Job and have been a lighting assistant on a multi-million dollar movie and camera assistant on the NZ drama series, Burying Brian. -What have been the highlights, and any new shows in the pipeline? One of my highlights was building sets on a deserted, tropical island in Fiji for Celebrity Treasure Island. I was on the island for two months as a builder and underwater cameraman; it was a one-in-a-million job! An on-screen highlight? Geese, that would be hard to say, but I did have a lot of fun on What Now many years ago. As for shows in future, Mitre 10’s keeping me pretty busy for now! – Despite 30 years’ experience as a builder, have you now well and truly ‘gone Hollywood’? Definitely not! I’m much more a builder than a TV guy. My role with Mitre 10 does means I’m not building full time, but it’s really the dream job – I get to meet lots of people, teach adults and children to build and I still work on great building projects. While I’m not building as much as I used too, I’ve not given it up. – How did you become presenter of Mitre 10’s Easy As and how successful has it become? I had a call from a former colleague who now works at TVNZ. I wasn’t actually sure what the role entailed and thought it was for a one-off advert. I’m told they picked me as I’m a genuine builder who could talk about the job while doing it at the same time. Mitre 10 Easy As has been successful because it’s a really helpful way for people to find the information they want. Kiwis have a ‘can do’ attitude and generally want to have a go at DIY, but they might be a bit unsure of how to tackle tasks. Easy As addresses this and helps people see their projects through successfully. – What’s planned for future episodes of Easy As? You name it, we’re doing it! At the moment we’re shooting: how to attach a pergola to your house, how to make exposed aggregate pavers, how to put up guttering, and loads more. – How popular are Mitre 10’s Ladies’ Nights, and, in general, how good are Kiwi ladies at DIY? They’re hugely popular! Often 500-1000, ladies show up. Many are really capable, and those that aren’t or are lacking in confidence are really willing and eager to have a go and learn. – If you could be Minister of Housing for one day, what would you do first and why? Make it mandatory that every house has a W.O.F, so everyone would be living in a warm, dry, healthy house. Bruce Springsteen, because he can entertain the guests and just because he rocks! Bob Dylan, because he has written pretty much the best songs and lyrics of all time – I’m not sure we would get a huge conversation out of him, but you never know. Lastly, my granddad – or, as we called him, ‘Grumps’. He passed away about 30 years ago; he was one good bloke! He could fix anything, could arm wrestle giants, had hands like spades, feared nothing and loved his grandkids!